Some days you just can’t take yourself too seriously. While we were enjoying our vacay in serene Seabird we got a message letting us know some surprise visitors were headed our way. The delightfully fun and crazy Karamfiles family (along with some of their Plester family) were headed our way for a stay and a look around. So I took the opportunity to have my first “bald mates” photo. With Richard, not Sharon! These crazy kids have been amazing friends since long before my diagnosis and certainly during this incredibly testing time. They are the kind of friends you want — and need in your life. The kind who, after you shave your head, you can ask if you now need to put suncream on your exposed noggin! They keep it very real and full of humour when you need it most. There’s not enough champagne (Veuve in particular) or good old Aussie beers in the world that can thank them for the help they’ve given us. 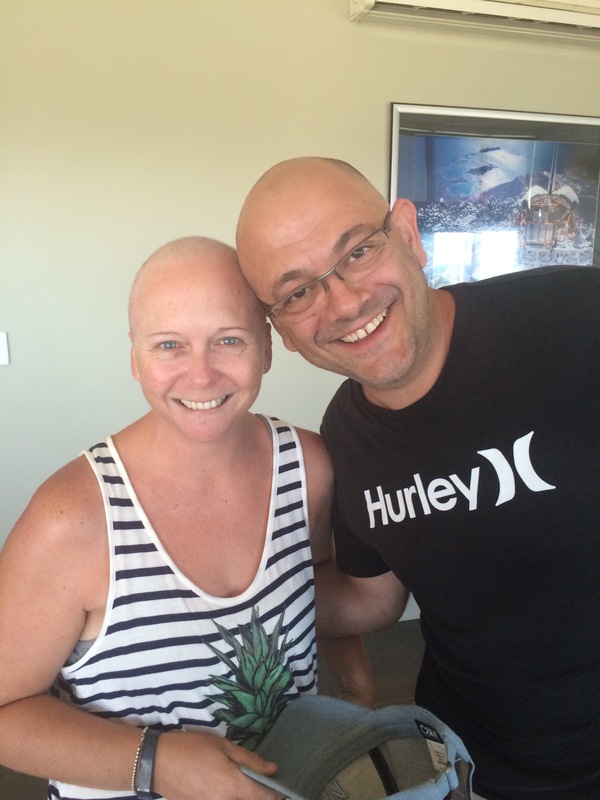 The pair of them will be incredibly embarrassed to be singled out like this — but here’s cheers to great (bald) mates!! On ya mate. You are just terrific.